I asked for examples of things that are Poisson distributed in class. One student said the number of chocolate chips in a cookie are Poisson distributed. He’s right. Here is the intuition of when you have a Poisson distribution. First, you should have a counting process where you are interested in the total number of events that occur by time t or in space s. If each of these events is independent of the others, then the result is a Poisson distribution. 1) The cookie has stationary increments, where the number of chocolate chips in a cookie is proportional to the size of the cookie. In other words, a cookie with twice as much dough should have twice as many chocolate chips (N(t) ~ Poisson (y*t)). That is a reasonable assumption. 2) The cookie has independent increments. The number of chocolate chips in a cookie does not affect the number of chocolate chip cookies in the next cookie. 3) A cookie without any dough cannot have any chocolate chips (N(0)=0)). 4) The probability of finding two or more chocolate chips in a cookie of size h is o(h). In other words, you will find at most one chocolate chip in a tiny amount of dough. All of these assumptions appear to be true, at least in a probabilistic sense. Technically there may be some dependence between chips if we note that bags of chocolate chips have a finite population (whatever is in the bag). There is some dependence between the number of chocolate chips in one cookie to the next if we note that how many chips we have used thus far gives us additional knowledge about how many chips are left. This would violate the independent increments assumption. However, the independence assumption is approximately true since the frequency of chocolate chips in the cookie you are eating is roughly independent of the frequency of chocolate chips in the cookies you have already eaten. As a result, I expect the Poisson is be an excellent approximation. Based on the curiosity over my cheese-related exam question on twitter, I have decided to post the midterm for my graduate level course on stochastic processes. My favorite questions are #1 and #2. I should note that #1 was inspired by actual leftover cheese that is packaged and sold at a discount at the Babock Dairy Store on campus (picture is below). If there is enough extra leftover cheese, it is poured into a bag, leading to cheese that has layers like an onion. It is apparently not cost-effective to repress the leftover cheese into a smooth brick of cheese. As someone who didn’t grow up wearing a foam cheese hat, I find that cheese production, quality control, and inventory is the right avenue for me to learn about cheese. Students are confused by my cheese quality control exam question. 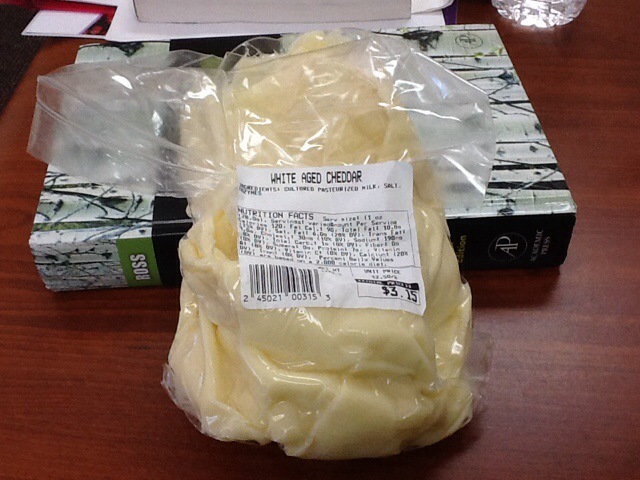 Shouldn't Wisconsin students know a lot more about cheese? 1. The dairy plant in Babcock Hall makes one batch of cheese six days per week. The amount of cheese (in pounds) left over after each batch is distributed according to an exponential distribution with parameter 1. Cheese production on each day is independent. The Babcock Dairy store will package and sell any leftover cheese in a batch (i.e., a day) that is more than 1 pound—a “cheese factory second.” Let Ei be the event that there is more than 1 pound of cheese available on day i, with i = 1, 2, 3, 4, 5, 6. Ei = 1 if there are cheese factory seconds for the type of cheese produced on day i and 0 otherwise (i.e., ignore how much cheese is leftover – we are instead interested in the binary outcome of whether cheese is leftover). E = the total number of types of cheese factory seconds across the 6 day week. a) Define E in terms of Ei. b) What is the sample space for E? c) What is the probability that there is at least a pound of leftover cheese on day 1? d) What is the probability that four or more days in the week produce cheese factory seconds? 2. The Lightsaber Manufacturing Company (LMC) operates their manufacturing plant in a galaxy far, far away. They need to decide to how many lightsabers to stock for the next Jedi Convention, where they will sell lightsabers to Jedi apprentices. Due to the expense associated with interstellar travel, LMC will discard the unsold lightsabers after the convention. Lightsabers cost 413 galactic credits to produce and are sold for 795 galactic credits (the unit of currency in the Empire). If the demand for lightsabers follows an exponential distribution with an average of 75 lightsabers, how many lightsabers should the LMC bring to the Jedi Convention to maximize its profit? 3. A student has a hard time figuring out how to get started on homework for Stochastic Modeling Techniques. The student randomly selects one of 3 potential places to start a homework problem with equal probability. The first approach is not fruitful; the student will return to the starting point after 1 hour of work. The second approach will return the student to the starting point after 3 hours. The third will lead to the solution in 15 minutes (1/4 hour). The student is confused, so he/she always chooses from all 3 available approaches each time. What is the expected amount of time it takes this diligent student to solve the homework problem? 4. A mysterious illness called “badgerpox” has affected the local badger population near Madison. The exposure level (X) largely determines whether a badger contracts the disease (D). The probability distribution for the exposure level and the conditional probability of disease given the exposure level are given in the table below. (c) The expected exposure level for badgers that have contracted the disease. 5. A student likes to come to ISyE 624 on time, which is possible as long as the student can travel from left to right in the diagram below. There are two paths to class; the student can pass through if and only if all components along its path are open. Due to construction, the probability that component i is open has probability pi, i = 1,2,3,4. Assume components are independent. If there is not a path to class, the student will arrive to class late, and the professor will be sad. What is the probability the student gets to class on time? 6. The Wisconsin-Minnesota football rivalry dates back to 1890. The teams play once per year for the trophy of “Paul Bunyan’s Axe,” which replaced the first trophy (the “Slab of Bacon,” 1930-1943)*. 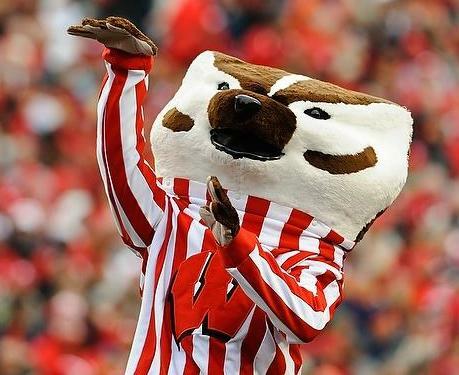 The teams are unevenly matched, with Wisconsin winning 16 of the last 20 games. Let’s say that Wisconsin wins each game independently with probability 0.8. The teams play next on 11/23/13. (a) What is the expected number of games/years until Wisconsin loses next? (b) What is the expected number of games/years until Wisconsin loses 2 games in a row? (c) What is the probability that it Wisconsin loses for the 3rd time in the 5th game in the series? * I didn’t make that up! Every time I teach stochastic processes, we discuss whether to play Russian Roulette (don’t!). In the off chance one absolutely has to play, we determine the best time to take a turn and whether it is best to spin the barrel. I believe in teaching important life lessons in class along with operations research. 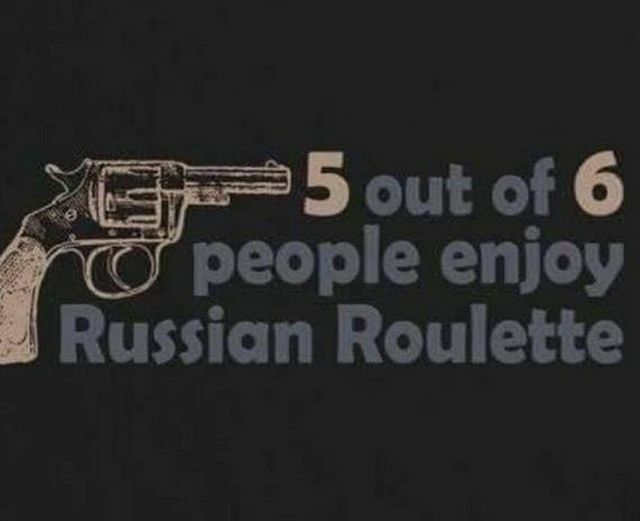 But in this case, I seriously hope none of my students consider this example on Russian roulette an important life lesson. This example is good for exploring how we can quantify probabilities to confirm our intuition. Just for fun, here are the relevant probabilities of death based on order and spinning strategy. (I like to mix it up with some dark humor in my classes). First, consider the odds with not spinning the barrel. This makes intuitive sense. The bullet goes into one chamber where it is “preassigned” to one player of the game. Next, consider the odds with spinning the barrel. Continuing in this way, we can compute the odds of death based on each player’s order. Without spinning the barrel, someone will lose. If every players spins the barrel prior to his/her turn, there is a 33.5% chance that everyone will walk away from the game. Such a small action greatly affects the outcome of the game, especially for those who are among the last to go. We can see here that there is no guaranteed way to win at Russian roulette. However, going last after everyone spins the barrel lowers your probability of losing by 60%. The National Weather Service released a report on being struck by lightning [Story here] that may be of interest to those of you read my previous posts on lightning (see below). The study confirms that men account for 82% of those struck by lightning, which I’ve blogged about before. 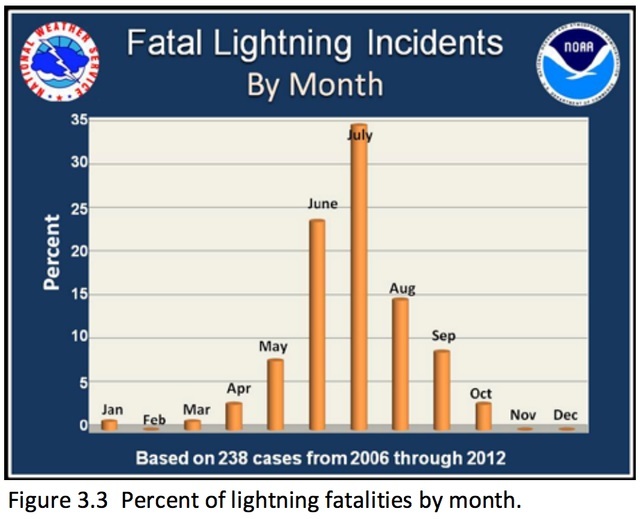 More people are struck by lightning in July than in any other month. NOAA states that June, July and August have the most lightning in addition to having the most lightning fatalities, In fact, I was caught in a severe storm that rolled in quickly when I was running in a forest preserve in June. I suspect that the conditional probability of being struck by lightning doesn’t depend on seasonality as much as the picture above suggests, but I don’t have any proof. The Washington Post Magazine ran a nice story about the ‘Spark Ranger’ Roy Sullivan who was struck by lightning seven times [Link]. A man who worked outside, Roy Sullivan was at an increased risk of getting struck by lightning. I’m not sure how that happened seven times. what is the conditional probability of being struck by lightning? Realtors sometimes think that the optimal solution is to convince their clients to accept the first offer made on their house. The marginal increase in the realtor’s fee is tiny if the sellers wait to get a small increase in the selling price (a 3% commission on the extra $2000 that the sellers are holding out for is a measly $60. The realtor may invest more than $60 to better market the house while waiting for a slightly better offer to arrive. See the video from the Freakonomics documentary below for more on this subject. We ended up using the optimal Secretary Problem policy to sell our house. It wasn’t our plan on the offset, but it’s what happened. An optimal policy to the Secretary Problem maximizes the probability of ending up with the best offer. The idea is to first estimate the number of offers you would expect to receive, at least in the timeframe that you have to sell a house; let’s call this n. Then you observe and reject the first n/e offers. After that, you accept the first offer that is the best you’ve seen so far. I thought n would be small (2-3), but there was a lot of traffic in our house and I had to increase my estimate of n to maybe 6. The first person to look at our house made us an offer almost immediately. It was a good offer, but the buyer wanted to close a month earlier than we were ready, which would lead to some substantial costs on our end (not counting the stress of having to make immediate moving plans and find temporary housing). The net offer was good, but not good enough for us to sell our house. We let it go. At the time, this seemed like our n/e, which meant that we should accept the next offer that was better than our first one. We had a second offer on our house that eventually worked its way up to match the net value of the first offer. It was too low, so we rejected it (and almost gave our realtor a heart attack in the process). We then had a third offer on the house that was not worth entertaining. Later that day, we received our fourth offer. After some negotiation, it became our best so far, and we accepted it. It’s not often that I get to personally collect empirical evidence to validate an OR model. I’d like to say that it was fun, but it was mostly a stressful experience. I’m glad it worked out in the end. During the process, it was helpful to know that math backed us up on our offer rejections. We ended up with that extra $2000 (less $120 for both realtors). Comment: When I say we “rejected” offers, I mean that we counter-offered with what we were willing to settle for and were turned down. Accepting/rejecting offers is a little more complicated when selling a house as compared to the secretary problem, where there is no negotiation. Incidentally, the Wall Street Journal recommends using the Secretary Problem for finding a rental [Link]. My last blog post illustrated how unlikely the equal birthday likelihood assumption is. I wrote a short simulation code to consider the impact of unequal birthdays. I modeled unequal birthdays as a mating season that results in three months (90 days) that are more likely birthdays than the remaining 365-90 days. This corresponds to July – September in my earlier post. Let R = (Likelihood of being born in the “hot” 3 months) / (Likelihood of being born in the remaining 9 months). The Birthday Problem assumes that R = 1. I consider 1 <= R <= 2. This post courtesy of Chris Rump indicates that R < 1.2, meaning that humans don’t have much of a mating season. 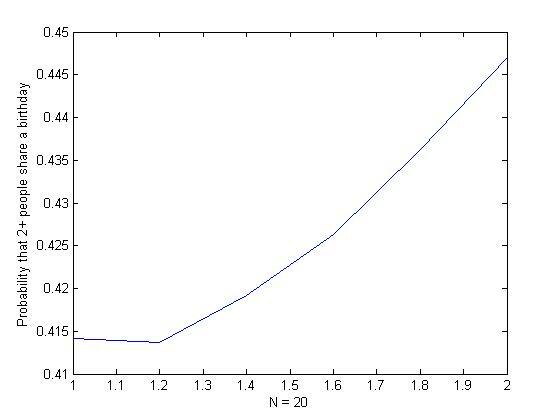 The simulations below show the average value of P(n), where P(n) = the probability that someone shares a birthday in a group of n people. The simulations are performed over 1M replications for each value of n. The probability of shared birthday goes up when people are more likely to be born in the birth months associated with “mating season.” But the effects are small, as can be seen by a fairly compressed y-scale. The simulations were performed in Matlab and the program is here. The Birthday Problem probability for n=5. 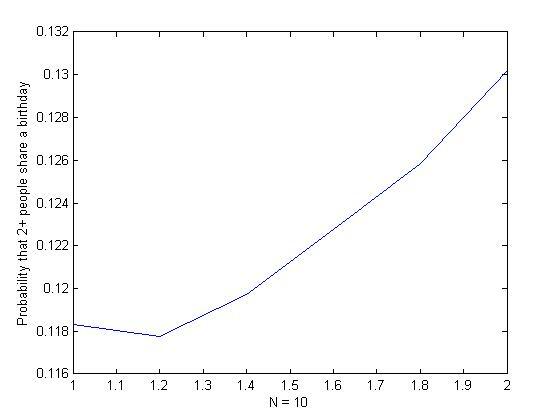 The Birthday Problem probability for n=10. The Birthday Problem probability for n=20. 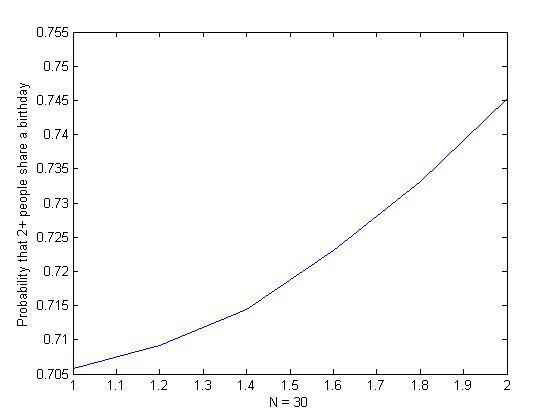 The Birthday Problem probability for n=30. 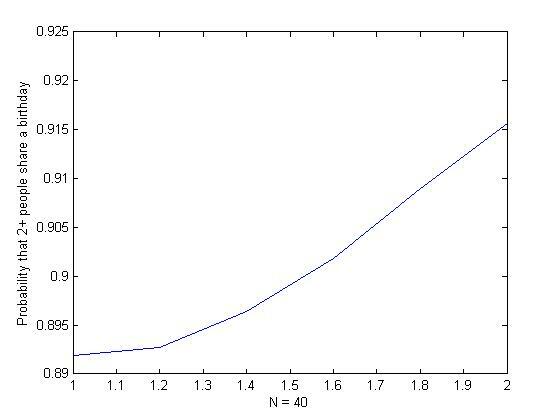 The Birthday Problem probability for n=40. 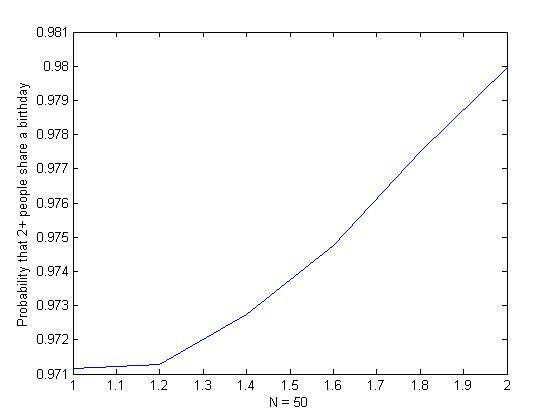 The Birthday Problem probability for n=50. Many of you have seen The Birthday Problem: Given a group of n people, what is the probability that someone shares a birthday? Here, we are only concerned with birth day and month (not year). The solution assumes that a person is equally born on any of the 365 days in the year, thus ignoring leap years. P(n) = 1 – Q(n) = 1 – (365*364*…*(365-n+1))/365^n. 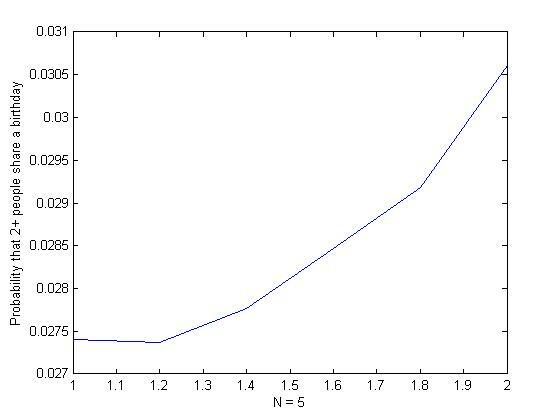 P(60) = 0.9941 –> in a room with 60 people, you are almost certain to have at least two people that share a birthday! The key assumption is that all birth dates are equally likely. This NPR article shows that humans have a “mating season” that makes July – September birthdays more likely. I posted the image below. This will, of course, change our answer above. The probabilities depend on who is in the room. Have you simulated the Birthday Problem with an unequal birthday distribution? If so, please shed light on realistic numbers for P(n). On a side note, the image below suggests that babies are induced on December 27-30 for a tax break. I’m not sure how I feel about that. 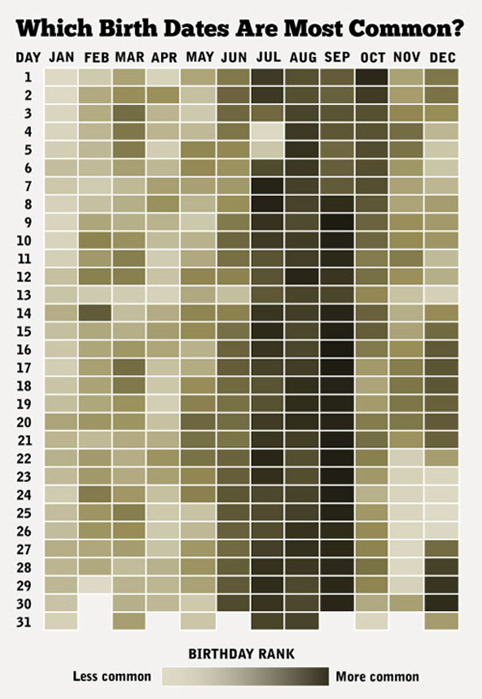 How likely are people to be born on different birth dates?